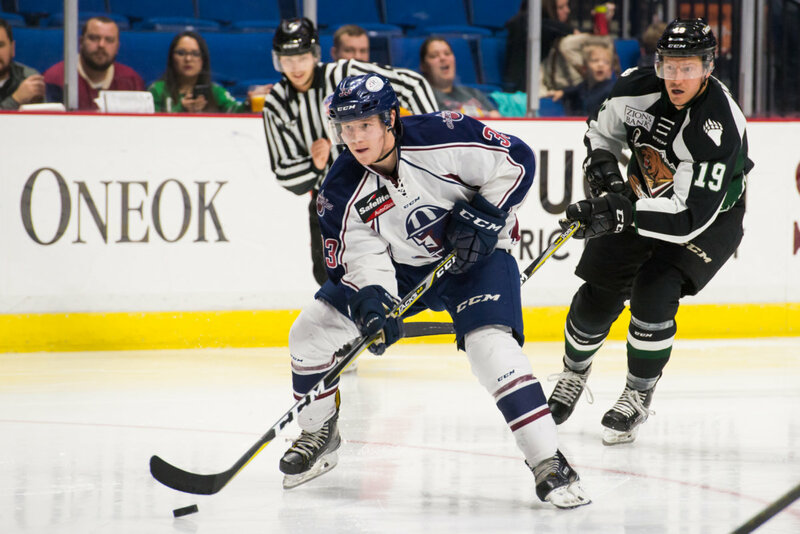 Tulsa plays fourth straight overtime game Sunday ahead of week-long break. >> In the first meeting of the season between Tulsa and Utah, the Grizzlies opened the scoring early in the first period, but Tommy Vannelli tied the game before the first break. Utah scored a power play goal early in the second period to go back in front, and the Grizzlies held on to that lead heading into the third. Evan Richardson evened the score at 2-2 for Tulsa 14 seconds into the third period with a short-handed goal as the Oilers went to overtime for the second straight game. Taylor Richart fired a power play goal past ECHL Goaltender of the Month Devin Williams to give the Grizzlies the win. >> The Oilers jumped out to a 3-0 first period lead Saturday thanks to goals from Adam Pleskach, Eric Drapluk and Conner Bleackley. Utah cut their deficit to one in the second period thanks to back-to-back goals from Brendan Harms. Tulsa defenseman Dmitrii Sergeev added an insurance goal to make it 4-2, but the Grizzlies clawed back again to force overtime. Bleackley provided the heroics 28 seconds into overtime with his second goal of the night and 7th of the season to give Tulsa its second OT win in six days. >> Allen Americans goaltender Stephon Williams saved 46 of 47 Tulsa shots and another 6 of 7 in a shootout to backstop the Americans to a 2-1 win over the Oilers. Eric Roy scored a power play goal for Allen in the first period, and Steven Kaunisto tied the score for Tulsa in the second period. With no scoring the rest of the way, the two teams skated into overtime for the second straight meeting. For Tulsa, it was their fourth straight overtime contest. Oilers goaltender Jake Hildebrand stopped 33 of 34 shots in the shootout loss. Dmitrii Sergeev is tied for second among ECHL defensemen with 8 assists. Forward Conner Bleackley is tied for third in the league with 7 goals. Rookie Devin Williams won the ECHL Goaltender of the Week and ECHL Goaltender of the Month last week. Tulsa extended its point streak to 6 games, picking up 10 of a possible 12 points in that stretch. 5 of the Oilers’ 11 games have gone to overtime, including the last 4 contests. Tulsa has the same amount of short-handed goals (5) as power play goals (5). The Oilers are averaging 38.91 shots on goal per game, which is third in the ECHL. Tulsa has recorded over 30 shots in 10 of its 11 games, and pass the 40-shot plateau 5 times. Come out to Lefty’s on Greenwood in downtown Tulsa on Monday, Nov. 6 from 6-7pm for the next Tulsa Oilers Coach’s Show. Hear what Coach Rob Murray has to say about the weekend’s games and the week ahead for the Oilers. Get to know two Tulsa Oilers players (TBD) who will be guests on the show.